Make the most of every opportunity to shine. 'They're watching me' is packed with scientifically proven strategies to teach you how you can give your best performance, no matter who is watching. Is there a worse feeling than knowing you've got this chance to perform, yet DREADING it because you're so scared you'll make a fool of yourself or mess it up? If you've ever had the feeling of sweaty palms, heart pounding, dry mouth-ed FEAR in the face of a great opportunity, this is for you. Includes OVER 20 Practical, Effective Strategies For Increasing Performance Confidence And Focus! Even if you're just not as confident as you want to be, this course is packed with scientifically proven strategies to help YOU become confident when all eyes are on you. It IS possible to go from dreading the limelight to loving it. And by clicking the button below, you can have access to these strategies for yourself. Simply sign up now for IMMEDIATE ACCESS to OVER 20 proven strategies for increasing performance confidence and focus! Make the most of every opportunity to shine. 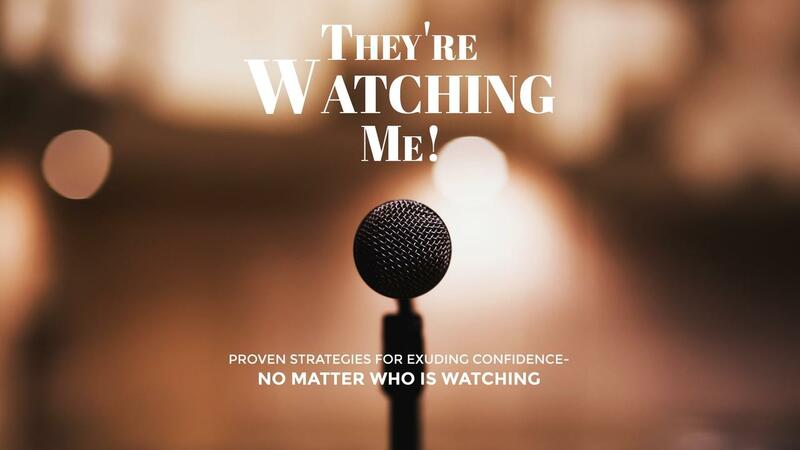 'They're Watching Me' is packed with OVER 20 scientifically proven strategies to teach you how you can give your best performance, no matter who is watching.